Find It! Paint It! Love It! Farrow & Ball, that wonderful English paint company is hosting a series of talks and events on how to add a bit of punch with color to your interior décor. However, they are all taking place in London!! But, good news! You can get all sorts of great advice, inspiration and a list of the events – in case you are planning a trip abroad, from their web site: us.farrow-ball.com/talks/-events/contentI love to include a “hands on” experience when I travel. One year in Florence I taught a decoupage class. It was the most memorable part of my trip. Imagine teaching 80 Italian men and women (who did not speak English nor did I speak Italian)? However, like music, crafting can be communicated with show and lots of hand motions and these were all professional craftspeople. My sponsor printed up instructions in Italian and handed them out to everyone. My friends, Debbie and Ron Lily took a cooking class in France and Key West friends, Pat and Lou spent two weeks studying at Oxford in London. Just a few ideas for hands on travel. By custom painting furniture pieces, railings, a, banister, doors, door frames, even a chandelier, you can inject personality and interest to your décor. I am one of those people who loves to paint (not the kind that requires talent). There’s something exciting and satisfying about finding an old piece of furniture for not much money, seeing its potential and restoring it with a new and interesting color, Farrow & Ball has those great paints in the most “to die for colors” – I buy them without knowing what I’ll paint, if for the names alone. Just imagine a room painted in Elephant’s Breathe? Now Really! You don’t even have to know what color it is to love it. I’d buy Chrysalis to paint anything, just to be able to tell people the name of the paint when asked. 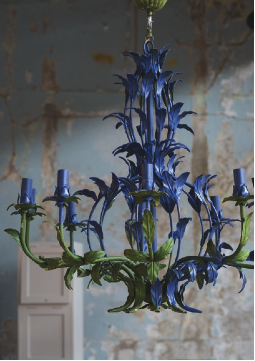 This reclaimed metal chandelier from the Farrow & Ball studio is painted in Pitch Blue® No. 220 and Estate® Eggshell, although it looks like green in the photo, which I would choose. This blue color would be a great accent for a small chair, the inside of dresser drawers, on a mirror frame, or a small table or chest. 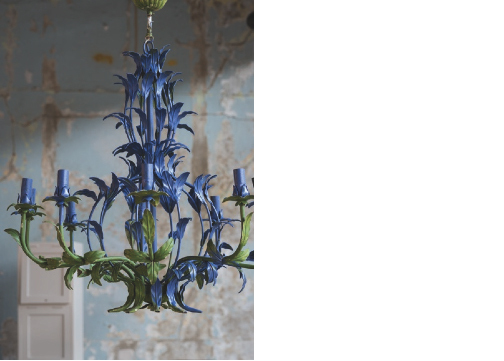 It’s really easy to transform furniture or an accessory, like this chandelier, but you have to know how to spot something, analyze how much work it needs on the spot, and make a quick decision. What does this mean? Simply know your own limits. How much talent do you have or time for this sort of thing? I ALWAYS think I can do more than my patience allows and nowadays (does anyone use that word any more?) I am less patient than I used to be. I’m looking for instant gratification. If you want long, complicated projects, check out some of my earlier craft books written when crafting was hot. Fortunately I’ve expanded my horizons to include sitting on the beach occasionally. But, I want my home to look good and have a sense of fun and imagination. This is the perfect time of year for a crafty project. However, right now I need to take my own advice. During the winter, my friend Liz Winship, owner of Nantucket Looms and I were talking in Key West. This is our vacation time when all creative ideas have time to bubble and rise to the surface. I told her I had about 48 boxes that my grandfather made for me when I was selling my decoupage work to Tiffany, Cartier, Henri Bendel and Bergdorf Goodman in New York. “I don’t know what to do with them,” I told her. “Well, let’s have a retrospective show in August,” she suggested. Now, in late June they are all prepped and ready for decoupage and I am overwhelmed by this project. One box would suffice for anyone’s creative outlet, 48 is daunting! Years ago I would design these boxes with early botanical prints combined with whimsical figures from a collection of French storybook illustrations. Celebrities collected them. Now, along with the boxes on my studio worktable is a mirror frame, another frame for something I thought up a year ago but never did and a few other “in progress” projects. If you are in a crafty mood, start small and try to guesstimate how long it will take to finish. Set realistic goals. In the meantime I am designing a 36-inch glass tabletop and centerpiece for my designer table at the August Antique Show which opens July 31. Come to be inspired and maybe, just maybe by NEXT August I’ll have the decoupage boxes finished.